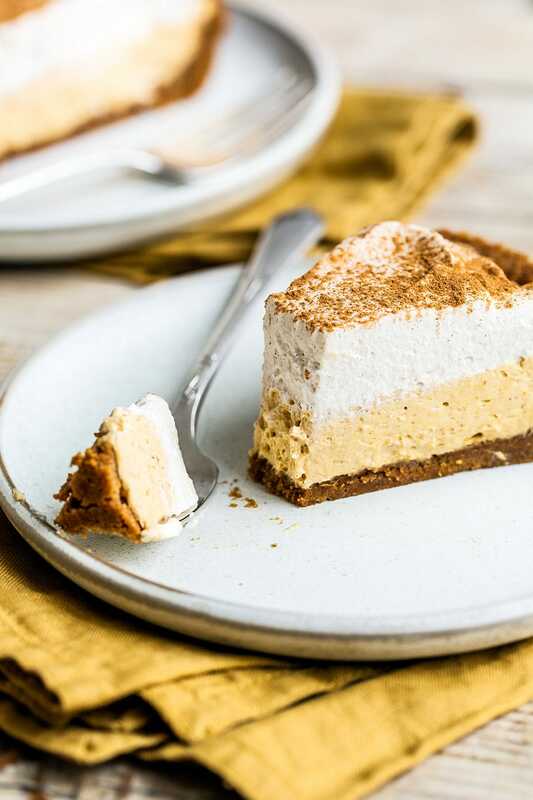 No Bake Pumpkin Mousse Pie features a thick Biscoff cookie crust filled with homemade pumpkin spice mousse and topped with fresh whipped cream. It’s the ultimate easy pumpkin pie for Thanksgiving! Download my FREE Make Ahead Baking Guide. Taste: Like a cloud of pumpkin pie. 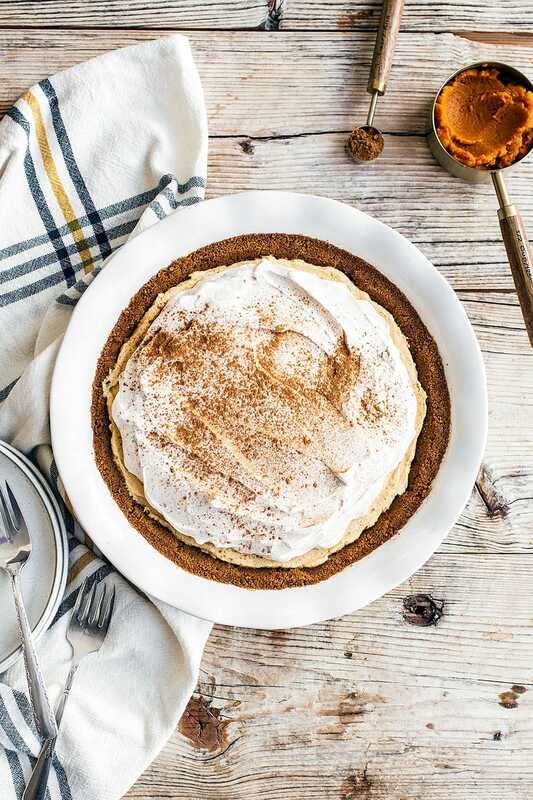 That Biscoff cookie crust really makes this pie something special. Texture: The crust is crunchy, the mousse filling is fluffy yet rich, and the whipped cream on top is light and creamy. Ease: You will dirty a few bowls to assemble the pie, but you won’t be taking up any space in your oven while doing it! 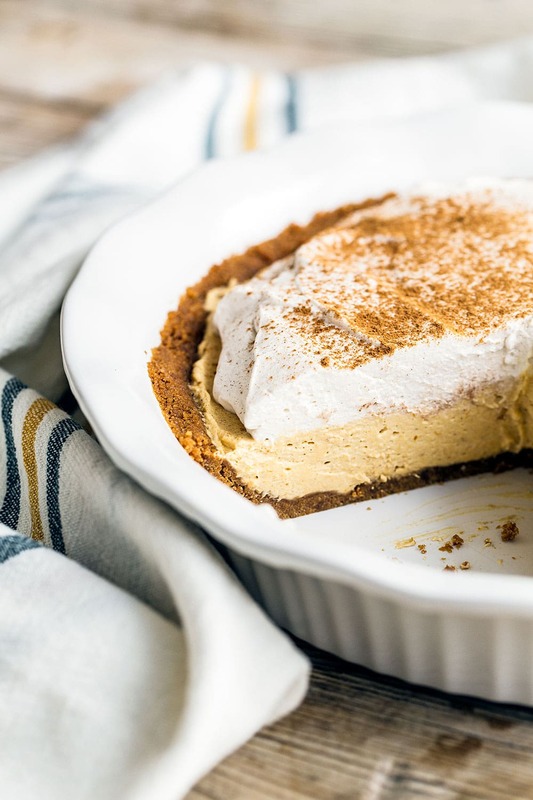 Pros: Fun and delightful twist on the classic pumpkin pie that you can make ahead of time without the oven. Would I make this again? Absolutely, this might become a Thanksgiving essential! Pumpkin pie has never been my favorite Thanksgiving dessert. I think it’s because it can often be pretty bland and boring. Especially in comparison to any show-stopping pies on the dessert table like a double crust apple pie or crunchy pecan pie. So this year I decided I want to put my own spin on pumpkin pie. I had already done a Salted Caramel Pumpkin Cheesecake recipe which was definitely a crowd pleaser, but it requires at least an hour in the oven. I don’t know about you, but the oven is valuable real estate in my kitchen this time of year. The last thing you want is to do any more mental time and temperature calculations trying to figure out just how you’ll cook everything, in what order, and at what time. So I decided to create a no-bake pumpkin pie that would be perfect for Thanksgiving. I’m SO pleased with how this recipe turned out. Everyone who has tasted it has loved it. I could eat a slice just about every night! 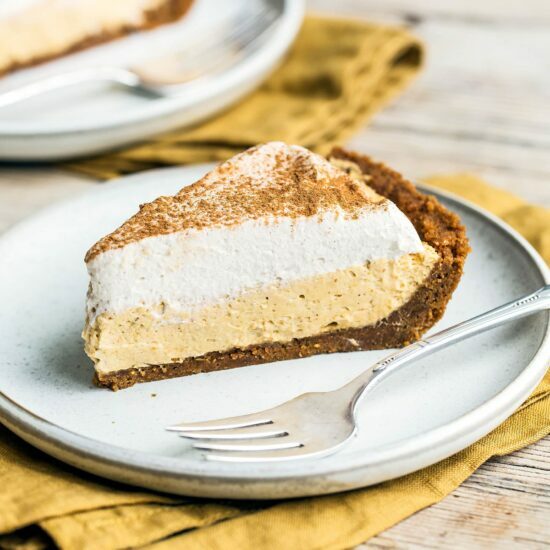 One of my favorite parts about this recipe is the Biscoff cookie crust! You know those cookies you often get on the plane? They’re kind of a cross between gingersnaps and graham crackers and are loaded with warm comforting spices and a kind of caramelized sweetness. I find them at most grocery stores now in the cookie & cracker aisle. They’re called Speculoos cookies at Trader Joe’s. Since there’s no baking involved in this recipe, it’s important to use a generous amount of butter in the crust so it won’t crumble too much. Be sure to really pack the crust into the pie pan. I like to use the bottom of a measuring cup to make easy work of this. 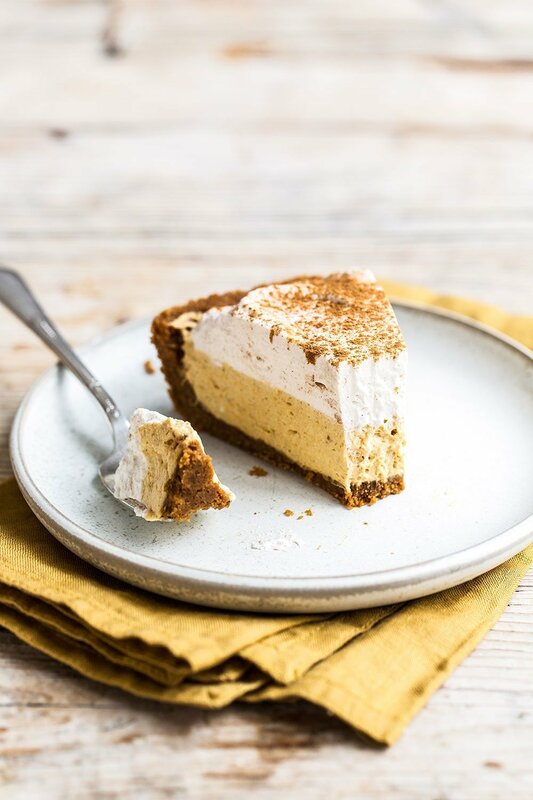 The filling is composed of a mixture of whipped cream, cream cheese, and pure canned pumpkin puree. You will need an electric mixer for multiple components of this recipe for best results! Be sure to use fresh spices for best flavor. If you open your spice jar and the aroma isn’t strong, it’s time to replace it. The filling will need to set for at least 6 hours. I usually just make the pie the night before I plan to serve it. At this point the pie can be stored in the fridge for up to 2 days. Nothing is better than homemade whipped cream, and in this recipe the stuff just really completes the pie! Be sure to top the pie with the whipped cream no more than a few hours before serving so it looks its best. The whipped cream will begin to deflate and “weep” if topped too far in advance. I love to garnish the pie with a sprinkling of ground cinnamon, or even ground Biscoff cookies, so it makes for a beautiful presentation. Spray a 9-inch pie dish with cooking spray. In a medium bowl, combine the cookie crumbs with the melted butter and until moistened. Press the mixture into the bottom and up the sides of the prepared pie dish. In a large bowl, use an electric mixer fitted with the whisk attachment to beat the cream until medium-stiff peaks form. Set aside. 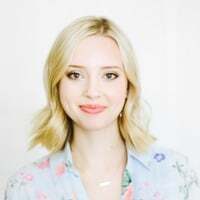 In a clean large bowl, use an electric mixer fitted with the paddle attachment to beat the cream cheese on medium-high speed until smooth and creamy, about 30 seconds. Add in the brown sugar, pumpkin puree, vanilla, cinnamon, cloves, nutmeg, and ginger and continue to beat until very well combined with no pockets of cream cheese remaining. Gently fold the whipped cream into the pumpkin mixture until combined. Spread gently and evenly into prepared crust. Cover with plastic wrap and refrigerate until set, at least 6 hours or overnight. In a large bowl, use an electric mixer fitted with the whisk attachment to beat the cream until it begins to thicken. Add in the powdered sugar, vanilla, and cinnamon and continue to whip until medium-stiff peaks form. Just before serving, spread the whipped cream over the pie. Sprinkle with more cinnamon to garnish, if desired. Serve. Sounds delicious and appeals to me more than the old standard. I think the only thing I would do differently would be to not cover the pie entirely with whipped cream. Instead I would add a generous dollop of cream to individual servings. We never finish a whole pie! Looks so good! Hosting Thanksgiving and thinking this is a must! On the mousse, the ingredients list 1c. of heavy cream twice. Is it 2 c. total then or am I reading it wrong? Thanks for your help! 1 cup of heavy cream to make the filling, one cup to put on top. Hi Tessa, would this pie freeze well? To Adriana’s Q: It is my opinion that as long as you save the top whipped cream for the day you serve, you should be fine. As long as you keep your pies wrapped. Just readIng the recipe and wondering if the pumpkin flavor is mild or greater. Has anyone tried adding more pumpkin, maybe 2/3 or 3/4 c? I know it would loosen the whole mixture, maybe too much. I just devoured 2 pieces of this pie after Thanksgiving dinner, and I’m thinking about going back for a third! I might be the worst baker in the world, but this recipe was easy enough for me to make, and it was truly delicious. Thanks for introducing me to this recipe, which will become a holiday tradition! Thank you for the recipe! I don’t like pumpkin lie because it’s such a weird watery, chunky, slimy yet firm texture. But I like the flavor! My daughter made this for thanksgiving this year and it’s deeeeeeeeelicious! She’s a nine year old award winning pie baker! She won the state contest (by first winning city and then county pie contests) with a triple layer key lime pie and it was in the general category, not kids. She’s amazing. Anyway, thanks for the recipe! PS your instructions say to mix the Graham cracker crumbs, not speculoos cookie crumbs.